The world is getting better, not worse. The Enlightenment ideals of reason and science are a major reason why. Is Violence Actually in Decline? What Defines Human Nature Today? Steven Pinker asks the big questions about human progress—and sets out, in public, to answer them. In 2018’s Enlightenment Now, Pinker argues that, despite the headlines, the world is getting better, not worse. (Bill Gates calls it “my new favorite book of all time.”) In optimistic keynotes, full of sharp wit, common sense, and dazzling argumentation, Pinker makes the case for reason, science, and humanism. These Enlightenment ideals, in the face of tribalism, authoritarianism, and other modern dangers to democracy, are worth celebrating—and protecting. A provocative speaker, much in demand, Steven Pinker is a cognitive scientist who has been named by TIME as one of the 100 Most Influential People in the World. His keynotes have helped millions demystify the science behind human language, thought, and action. Pinker is a Harvard professor, a TED speaker, and a bestselling author, twice nominated for the Pulitzer Prize. Highly respected in the scientific community, his work and opinions are extensively covered in the mainstream media, and have won a wide general audience. In his new talks—based on Enlightenment Now: The Case for Reason, Science, Humanism, and Progress—Pinker argues that, despite fear-mongering and political upheaval, the world is getting better: peace, prosperity, knowledge and happiness are on the rise. “The world is getting better, even if it doesn’t always feel that way,” writes Bill Gates, in a review of the book. “I’m glad we have brilliant thinkers like Steven Pinker to help us see the big picture. Enlightenment Now is not only the best book Pinker’s ever written. It’s my new favorite book of all time.” The New York Times included the book in its year-end list of 100 Notable Books, and NPR and Esquire both named it as one of the best books of 2018. Enlightenment Now is the follow-up to The Better Angels of Our Nature: Why Violence Had Declined, which was a #1 Amazon bestseller. Keynotes based on that book inspired audiences worldwide with its core message that, if you look at the facts, we are living in the most peaceful human era ever. The talks pointed the way to a better future for humankind. Pinker’s other bestselling books include The Blank Slate: The Modern Denial of Human Nature (“Required reading.” – Los Angeles Times) and How The Mind Works (“A model of scientific writing: erudite, witty, and clear.” – New York Review of Books). Pinker’s acclaimed “language” series includes The Language Instinct: How the Mind Creates Language, Words and Rules, The Stuff of Thought: Language as a Window into Human Nature, as well as The Sense of Style: The Thinking Person’s Guide to Writing in the 21st Century. A native of Montreal, Steven Pinker is Johnstone Professor of Psychology at Harvard University. Previously, he taught at Stanford and at MIT. He is a fellow of the American Academy of Arts and Sciences and the American Association for the Advancement of Science. He has won a number of teaching prizes, and his research on visual cognition and the psychology of language has received numerous awards, including the Troland Award from the National Academy of Sciences. What does a book about 19th century philosophy have to do with 21st century corporate culture? Plenty! In this keynote—drawn from the book Bill Gates called the best he’d ever read—the lessons are clear. The values of The Enlightenment transformed an entire planet: creating wealth, inspiring creativity, advancing science, empowering individuals, and introducing Democracy to America, France, and the globe at large. If these values can transform the world, they can transform an organization. A perfect discussion point for today—Steven Pinker will lead your audience through an exploration of who we are and where we are going, minus the baggage of today’s headlines. Faced with the ceaseless stream of news about war, crime, and terrorism, one could easily think we live in the most violent age ever seen. Yet as New York Times bestselling author Steven Pinker shows in this startling and engaging new talk, just the opposite is true: violence has been diminishing for millennia and we may be living in the most peaceful time in our species’ existence. For most of history, war, slavery, infanticide, child abuse, assassinations, pogroms, gruesome punishments, deadly quarrels, and genocide were ordinary features of life. But today, Pinker shows audiences how all these forms of violence have dwindled and are widely condemned. How has this happened? This groundbreaking talk continues Pinker’s exploration of the essence of human nature, mixing psychology and history to provide a remarkable picture of an increasingly nonviolent world. The key, he explains, is to understand our intrinsic motives—the inner demons that incline us toward violence and the better angels that steer us away—and how changing circumstances have allowed our better angels to prevail. Exploding fatalist myths about humankind’s inherent violence and the curse of modernity, this ambitious and provocative talk is sure to be hotly debated, and will challenge and change the way we think about our society. Why is so much writing so bad, and how can we make it better? Do people write badly on purpose, to bamboozle their readers with highfalutin gobbledygook? Is the English language being corrupted by texting and social media? Should we bring back the lost art of diagramming sentences? Have dictionaries abandoned their responsibility to safeguard correct usage? Do the kids today even care about good writing? Why should any of us care? In this talk, Steven Pinker argues that we need to rethink usage advice for the 21st century. Rather than moaning about the decline of the language, carping over pet peeves, or recycling spurious edicts from the rulebooks of a century ago, we can apply insights from the sciences of language and mind to the challenge of crafting clear, coherent, and stylish prose. Don’t blame the Internet, or the kids today; good writing has always been hard. It begins with savoring the good prose of others. It requires an act of imagination: maintaining the illusion that one is directing a reader’s gaze to something in the world. A writer must overcome the Curse of Knowledge—the difficulty we all have in imagining what it’s like not to know something we know. Skillful writers must be sensitive to the ways in which syntax converts a tangled web of ideas into a linear string of words. They must weave their prose into a coherent whole, with one sentence flowing into the next. And they must negotiate the rules of correct usage, distinguishing the rules that enhance clarity and grace from the myths and superstitions. The End of World Violence? In His Brand New TED Talk, Steven Pinker Argues that the World is Getting Better. But, We Must Adjust Our Perception to See It. 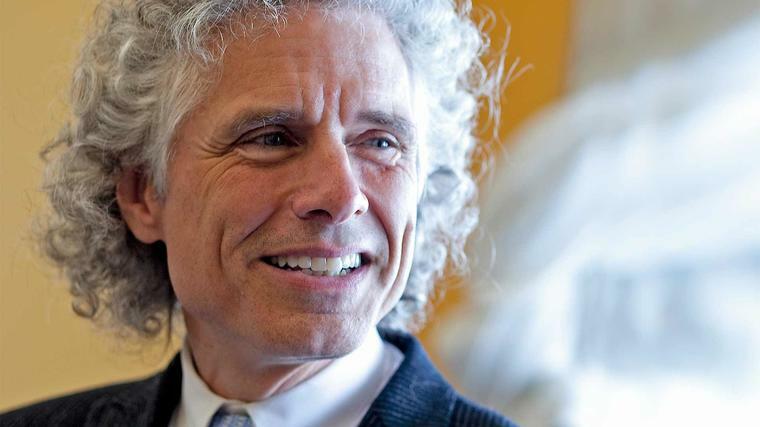 Ignore the Headlines, Says Harvard Professor Steven Pinker. Out Today, His New Book Explains Why The World is Doing Better Than You Think. Best Of 2012: Bill Gates Calls Steven Pinker's Book A "Triumph"
Is Society Getting Less Violent? In a New Book, Steven Pinker Says Yes.